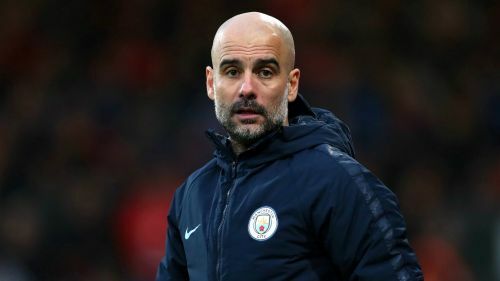 Pep Guardiola has told Manchester City they must be poised to take advantage of any Liverpool slip-ups as the Premier League title race nears its conclusion. Everton subsequently held Jurgen Klopp's men to a tight goalless draw at Goodison Park to leave City a point ahead of Liverpool with nine rounds of fixtures remaining. City have title-winning experience from last season's record-breaking success and Guardiola - speaking before Liverpool's draw at Everton - is relishing a tighter race. "I would prefer to be in last season's position - to be 12 points in front - but that is not normal, last season was an exceptional position," Guardiola told reporters on Saturday. "It is nice being there after what happened last season. We could have been 10 points behind when Liverpool played us at home, or could have been seven points after our defeat against Newcastle - and today we are top. "Of course they play tomorrow but all we can do is be there. Let them feel we are there, just behind them, around the corner. That's all we can do and if they miss one shot, take it. "It's nice to be there. We have two titles [Community Shield and EFL Cup] in our pocket for this season and being there with Liverpool - the best Liverpool ever in terms of points in the Premier League - and especially when you get 100 points you can relax and feel complacent. "Being there after what happened last season means a lot. We have a home Champions League game [against Schalke] where our fans can hopefully support us to make the quarter-finals of another prestigious title, and we are one game from the semi-finals of the FA Cup at Wembley. "That is not stress, it is completely the opposite, it is a joy." "We want the league and we will be disappointed if that does not happen but we cannot forget the contender we face with Liverpool," Guardiola added. "Of course we want to win the Premier League and I feel the players show me every single day they want to win it. "But we have played nine or 10 more games than Liverpool - that is a lot of minutes in our legs. We play in four competitions and we are still there. That's why I'm so happy. "In April, if we go through against Schalke and Swansea [in the FA Cup] it will be as demanding as November and December and January and February. We can rest a little bit in the international break but the most important ones will go away with their national teams. "My big concern is having players for after the international break because it will be a pity, it will be so sad after playing with this intensity for seven or eight months if they come back injured from the international break. That will be tough for us but hopefully they come back well."